User can save emails & contacts into single PST file by using lotus notes to outlook converter tool. 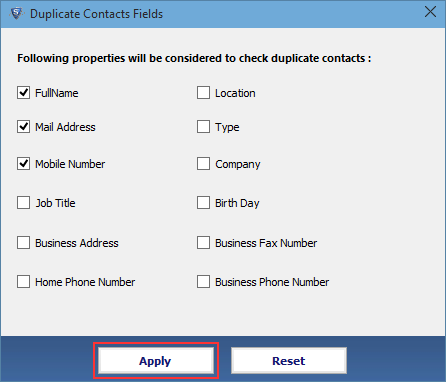 Lotus notes contacts path of names.nsf file should be provided to migrate all contacts into single PST file. Software support conversion of emails with attachments such as images, documents, links, files, and folders. Download nsf to pst converter software and convert entire lotus notes emails with attachments. Auto splitting file is also available on the basis of desired size of resultant pst file in MB/GB. The software will automatically split the pst file in given split limit. This feature enable user to manage conversion result. Filtration of emails by selecting a specific range of date. 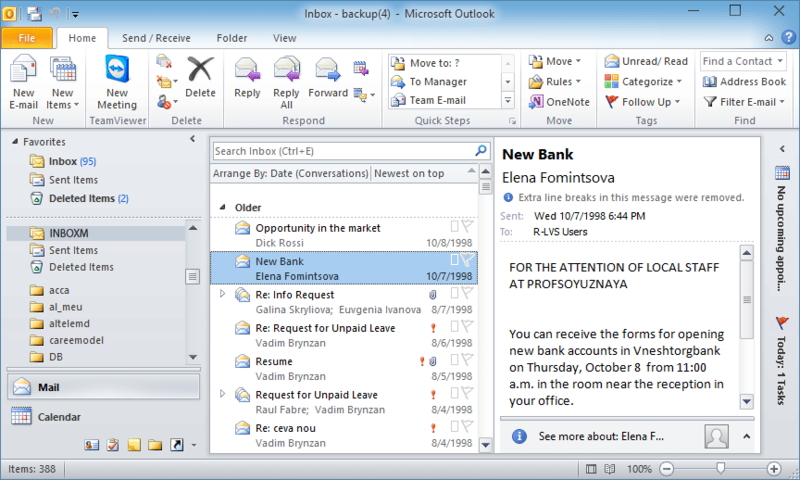 The messages falling within the selected date range will be included by the software. However, emails that precede & succeed the selected range will not be included. 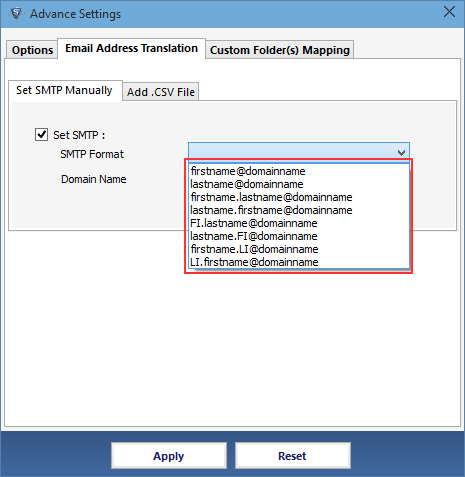 NSF to PST converter software allows to map the folders of the lotus notes to outlook. 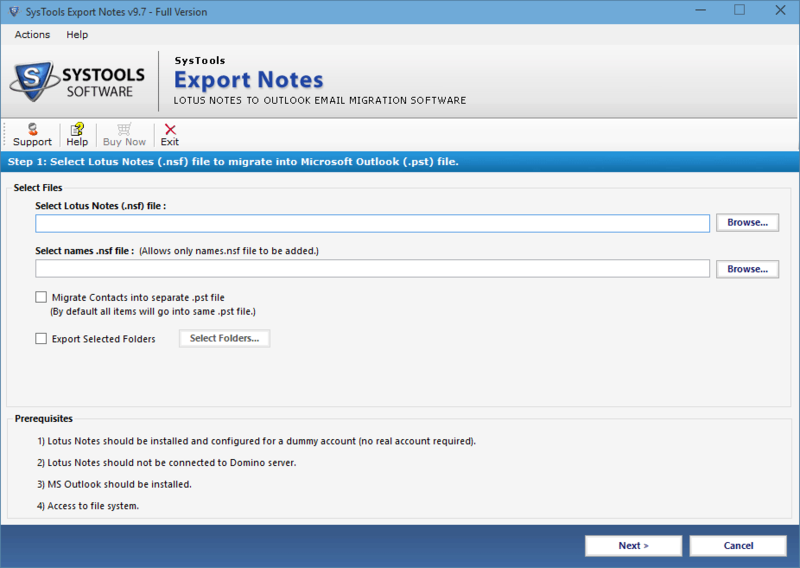 It means it will map the inbox of lotus notes with the inbox of outlook. 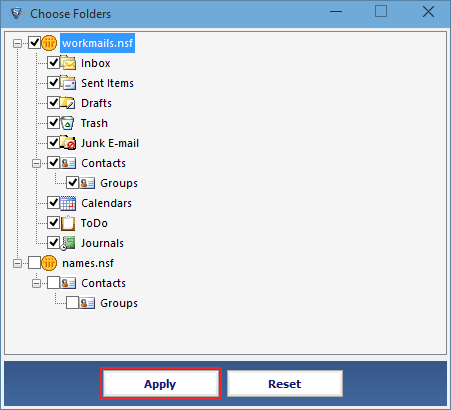 This feature is applicable for all folders like contact, journals, calendars etc. 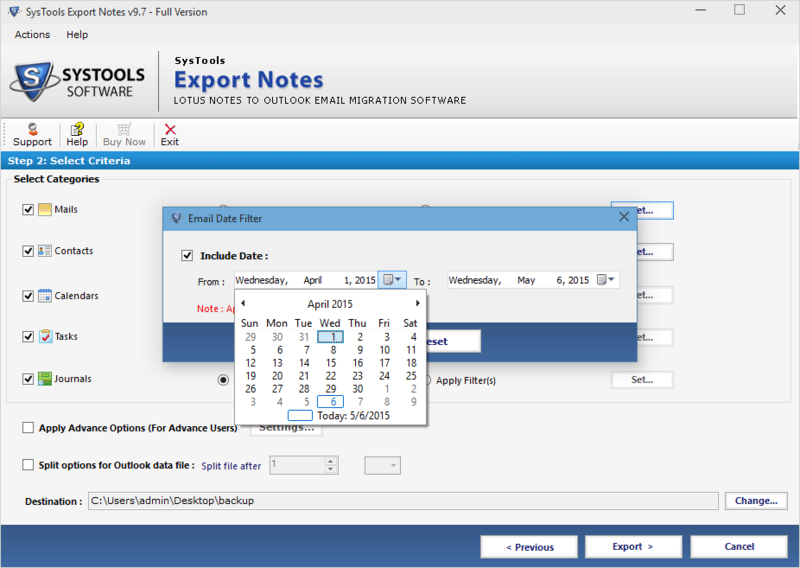 Similar to email filter, user can perform migration of lotus notes calendar data to outlook. In this only specified date range data will be included, while the one's which are not included the date range will be excluded. Selection of particular folder is also available in the lotus notes nsf to Microsoft outlook pst converter software. 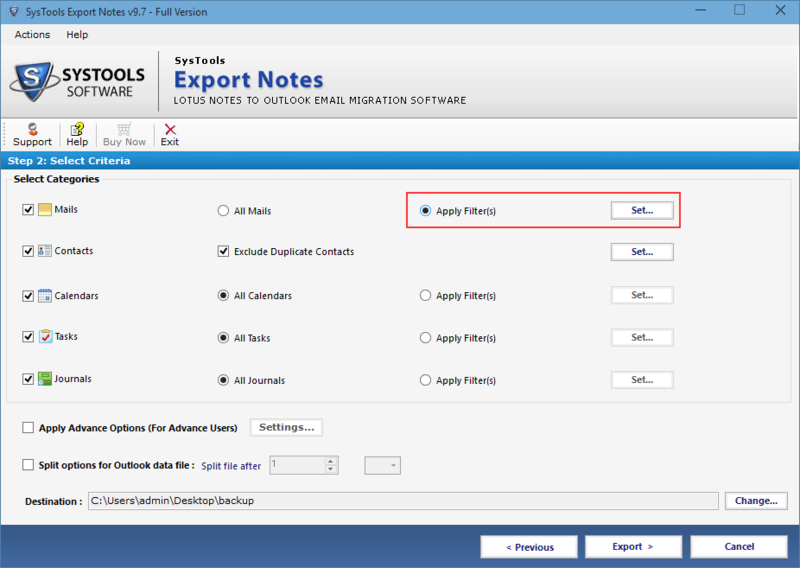 Migration of particular folder, instead of exporting all entire folder help user to export required data only. NSF to PST Converter Software will always preserve the HTML formatting. It ensures user that no change will occur during conversion process. In the resultant outlook file the HTML format will be same as in nsf file. Software allow user to remove all the security options in the mails during conversion. This feature of nsf to converter software ensures user to convert entire data either file or folder encrypted or not in source file. NSF files to Outlook PST converter software allows user to migrate all data from All Documents folder. Simply download the software online and brows the nsf file and hit on export button and You will find resultant in pst file. NSF to PST converter tool allows user to maintain the internet header with all technical properties associated with it in the lotus notes nsf file. Software maintains entire header feature in the converted pst file. In order to create links between two lotus notes documents, user can generate doclinks. 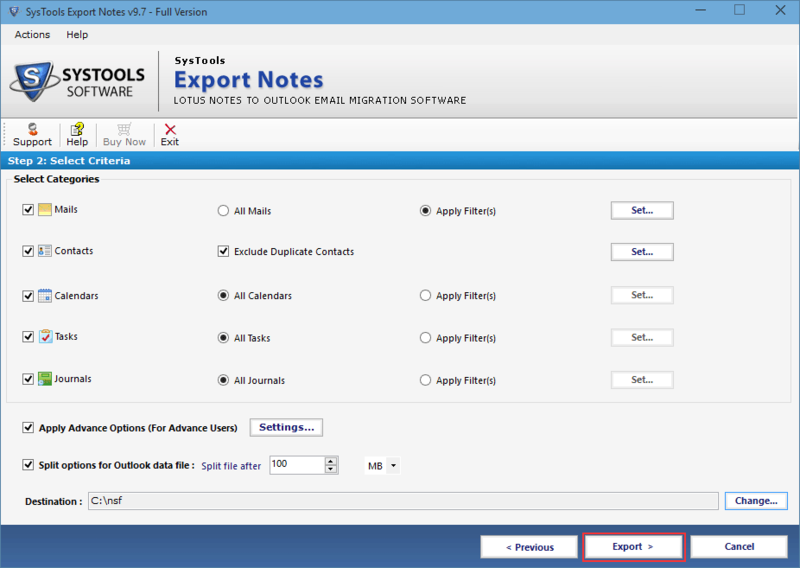 Exports Lotus notes software helps in retaining the doclinks while converting it to PST file. It makes easy to find required files in result. Does this software supports Windows 10 ? Yes, the software supports Windows 10 as well as the below versions. This tool Is compatible and works well in almost all the Windows versions. How much time does it take for conversion? It depends upon the file size and the system configuration. It can convert 2GB data in almost 10 minutes. Are Emails from a corrupt NSF file convertible? How do I access NSF data of 2 years back ? Earlier we received lot of such case. And in that scenario we only recommend SOFTWAREPRO NSF to PST converter, since NSF is offline storage thus NSF file cannot be opened in Outlook, so PST is easily accessible in Outlook. 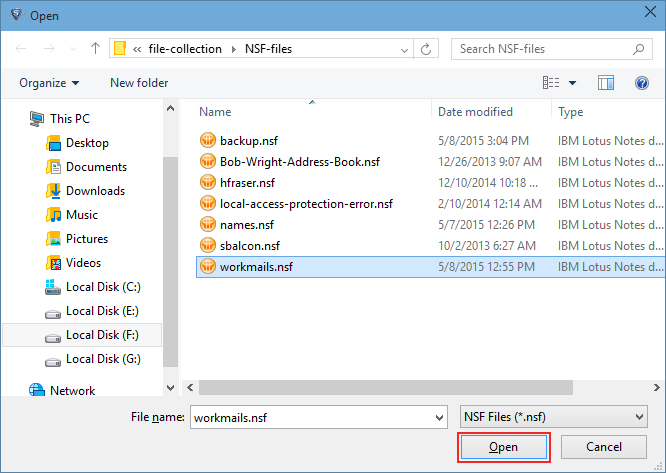 The tool easily export your offline NSF data file to PST. To access the data back you need to import the PST file in Outlook. What is the default location of .nsf file? 1.names.nsf (In which all the contacts are stored). 2. maildb (containing all the mails, tasks, journals, notes , calendars). How this tool is helpful? Lotus Notes to Outlook software allows users to convert Lotus Notes emails to Outlook emails. Software converts Lotus Notes emails to PST files. Go to Start » Launch the Software. You will be forwarded to the screen displayed below. Click on Browse to locate the NSF files. 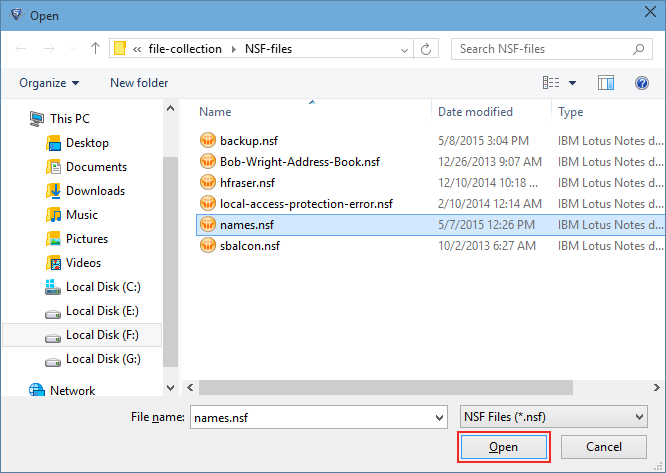 Select the NSF file from your system. If you want to convert Lotus Notes contacts into a separate PST file, then choose the Migrate Contacts into Single PST File to export the selected folder, Check the Export Selected Folder option & click the Select Folder option. Select the required folder and click Apply button. Select the category & Apply filters for each of it. By clicking on the Date filter you can include a particular time interval for exporting. For advance options click on Advance Settings. Now choose the Advanced Settings for successful Lotus Notes migration. HTML Formatting - This option lets you maintain all HTML formatting of emails during the process of its conversion. Internet Header – This option maintain the sent or received email header. 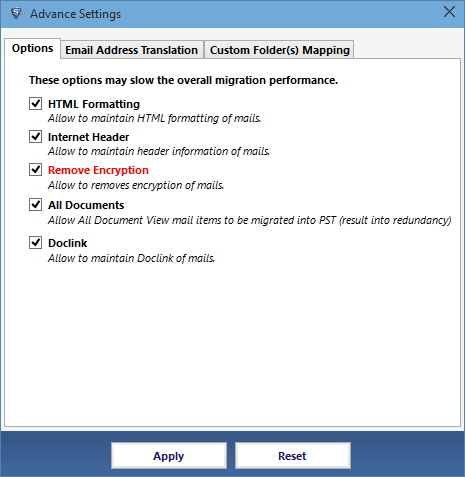 All Documents – Allow all document view mail items to be migrated into PST. Doclink – Allow to maintain Doclink of mails. 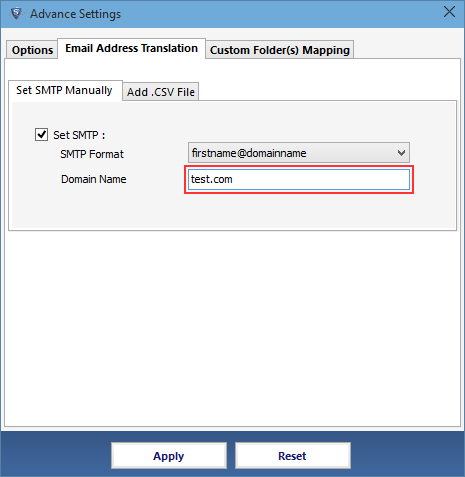 To convert the Canonical Name into SMTP format, Select the following naming convention. Enter the domain name for the SMTP translation with respect to the canonical name. 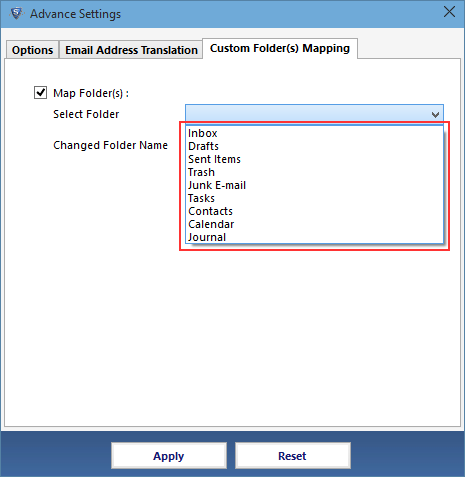 Click on Apply for Mapping of Lotus Notes default folder to Outlook default folder. Split PST option is provided to split your large file according to Size. The file could be splitted into GB or MB. You can also change the default saving location (after file conversion) by clicking on Change button. Click Export button to start the conversion process. 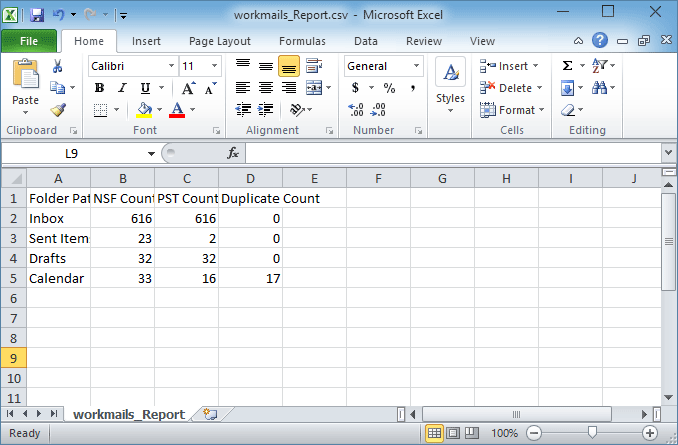 Step 10: Save export report in CSV format. 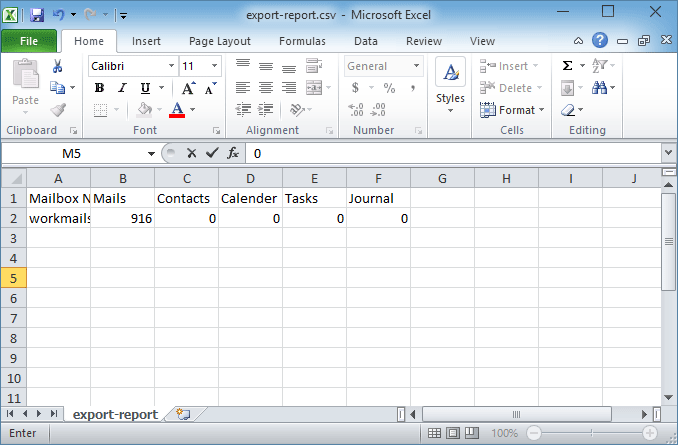 You can save the export report by clicking the Export Report button. 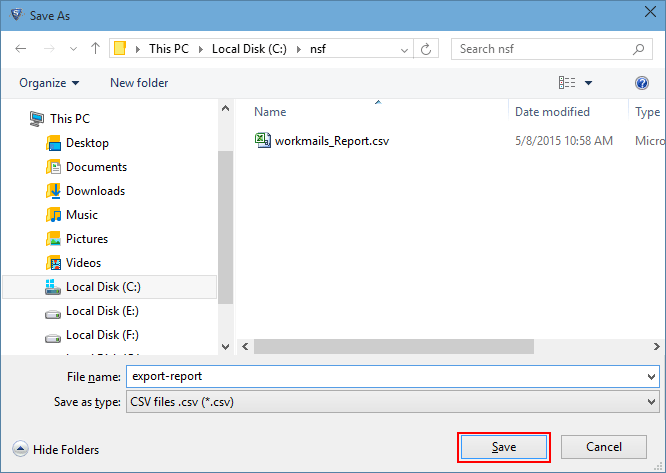 For saving the report into CSV format, enter the name of the report and Save it. View the export report that contains the file count. 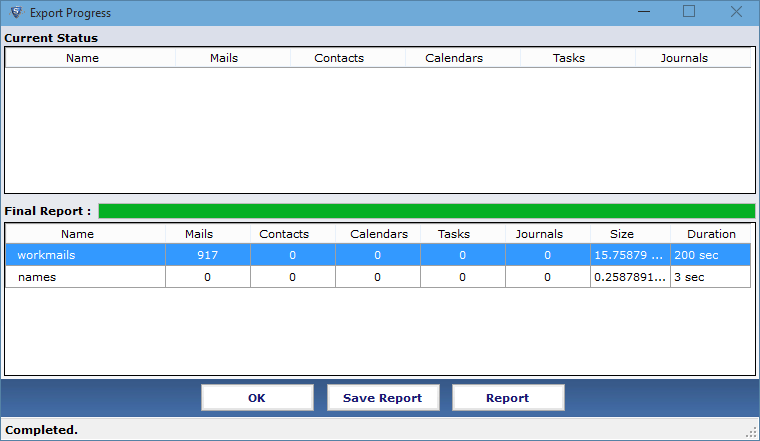 View the Export Report containing the folder count which is automatically generated by the Software. Browse to the destination location in MS Outlook, chosen at the time of conversion for saving the output PST. Choose the file and click on Ok, as shown below in the figure. After doing so, Outlook will open the selected PST file. "I was looking for a reliable yet reasonably priced application to transfer all of my NSF files into my personal outlook account. Many forums sites suggested many tools but this tool was the first one which was chosen by me and I was totally amazed and satisfied using it. 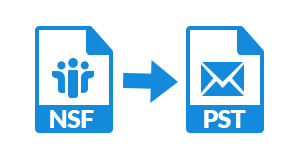 It was a good experience using this NSF to PST tool as it easily converts NSF to PST including the emails that have attachments with them.Thanks to the team!" "My company employees was having so much issues because they were in a habit of using PST files. They were not able to manage the .nsf files. 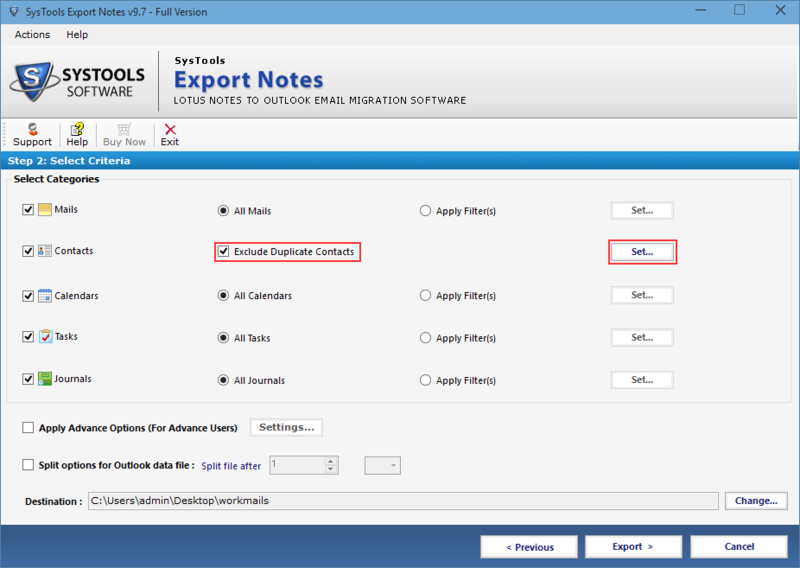 I searched for a tool for the conversion of files and guess what I got SOFTWAREPRO export notes tool which solved all the issues faced by my employees! It's really easy to use. Keep up the good work SOFTWAREPRO!"